I can’t be the only one who finds looking for a car seat an absolute minefield. Classes, groups, front or rear facing; there is so much to choose from on the market and so many different types and styles. So when I found myself searching through reams of suggestions for a high-backed booster for my four year old, Maggie, Apramo got in touch and suggested we try their Eros (Group 1/2/3) seat and give it a whirl. The seat arrived to much excitement from Maggie, who had been waiting for this moment for some time. She’d definitely outgrown her previous seat and was desperate to move into something more grown up – while I, of course, was determined to keep her in a bubble as much as possible. As we unboxed the Eros though, it was clear this was a seat that was going to fulfil both of our desires; front facing and it’s very sturdy, well made, with quality fabrics and padding. And for Maggie, it’s sleek, ‘grown up’ and apparently, looks ‘like a big girl seat should’. So she’s definitely happy. 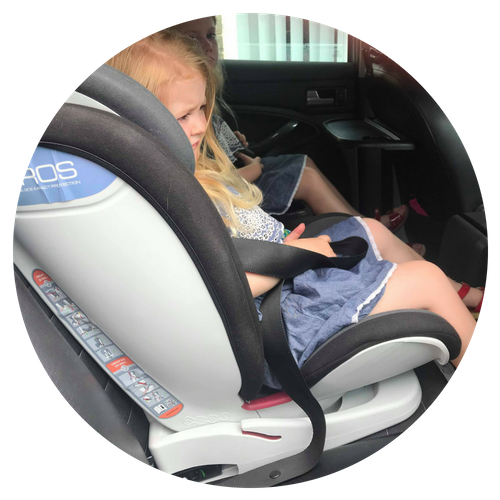 While we are reviewing the seat as a high-backed booster, it’s worth noting that it is suitable for Groups 1 and 2 too; so from 9 months to 12 years. For the younger child, the seat comes with a cosy insert to keep your baby snug and in position while travelling; five point HOLMBERGS harness and one pull adjustment for ease (for 9-18kg). One feature, that I love even with Maggie, is that it tilts back with a 4 position recline. I doubt a 12 year old will appreciate this feature much, but from 9 months to certainly 4 years, it’s a lifesaver for me to relax a sleepy one. 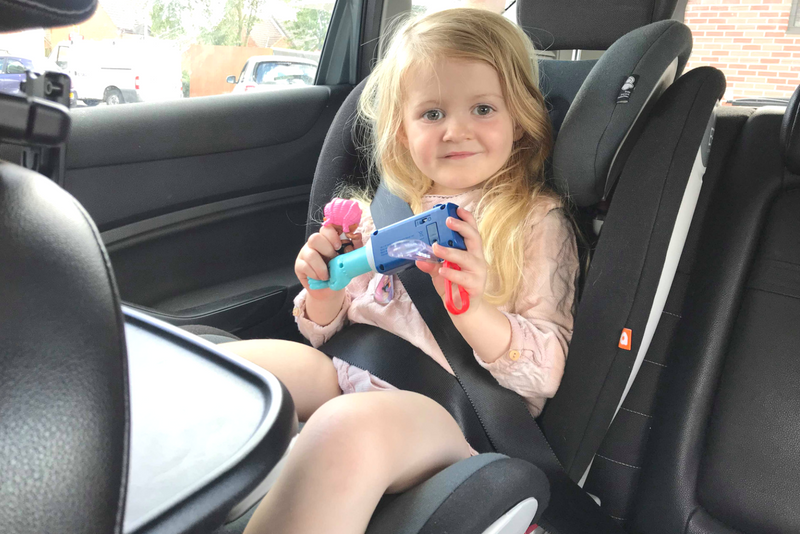 Finally, the side impact system on any car seat is really key for safety and the Eros boasts ultra SIP by ERS in both the head support and the seat shell, which is reassuring for parents for that possible eventuality that none of us really want to think about too much. 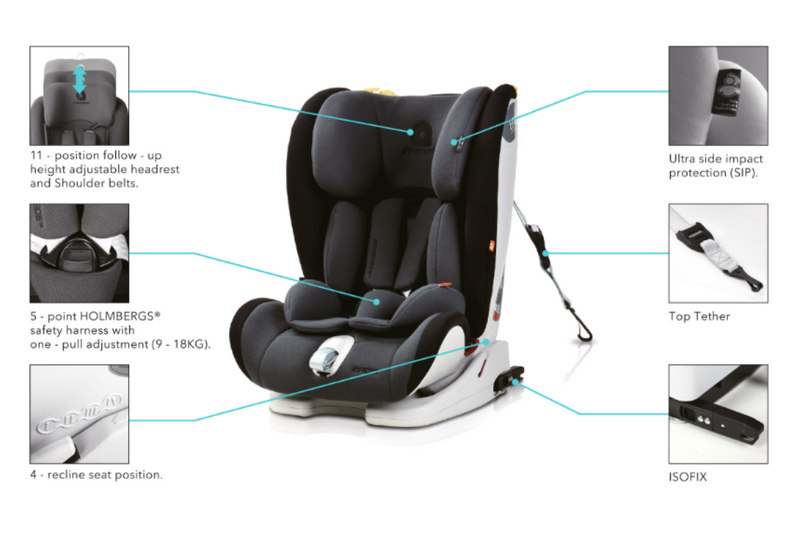 The headrest is fully adjustable with 11 points follow up height adjustment, so the seat really grows with your child. My eldest has had four car seats since she was a baby, so the reassurance that this is suitable to see Maggie through now for the next eight years is really something. 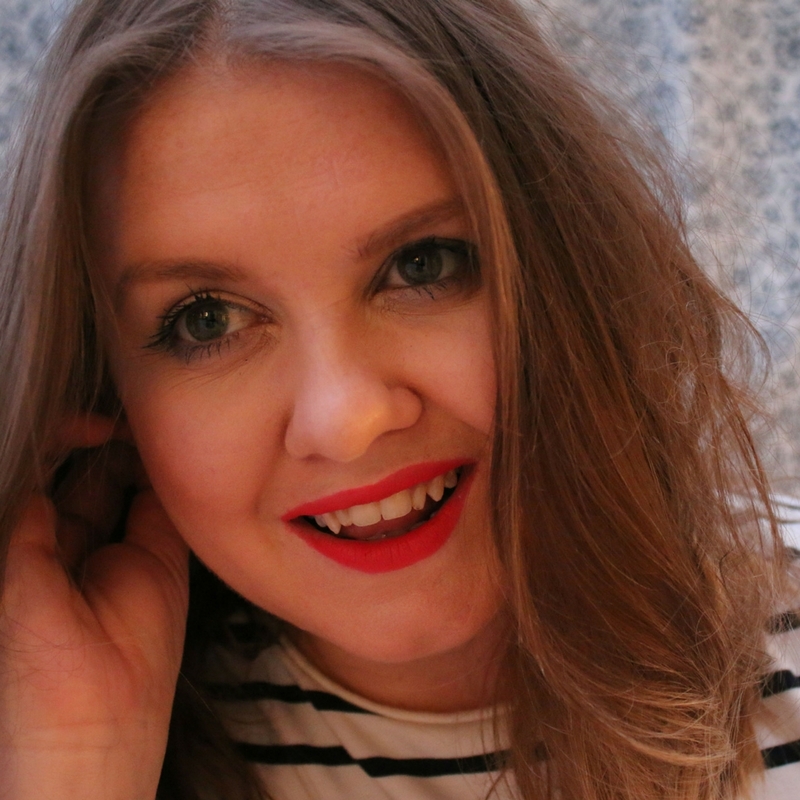 The fabrics and colour scheme are sleek – I’m not a massive fan of jazzy prints or characters etc. It’s trendy without detracting from it’s purpose, and the fabrics are breathable, quality BREATHEX. It can be removed (hurrah for those with younger children! ), softly padded for comfort and it can be washed (literally the holy grail when I think back to some M6 poonami moments) up to 30 degrees. Lastly, the seat comes in three colour-ways – all somewhat sounding like football strips but that might just be my husband’s wishful thinking; Sunderland (black and dark grey), Morecambe (light grey and grey) and Liverpool (red and black). If you haven’t heard of Apramo yet, you may not be the only one. They are pretty much a newcomer name against the familiar brands of Maxi-Cosi et al, having only started their young lives in 2008. But those ten years of experience have clearly been well spent; Johnny, the founder and importantly, a dad; and a group of friends started the company to create a range of baby products that would make a difference; and for many years, Apramo have focussed on manufacturing family products for household names across Europe. You may well have already owned or used an Apramo product without knowing! Now, they are keen to bring the Apramo brand to life, with their expert knowledge and experience at the forefront of the products they create. 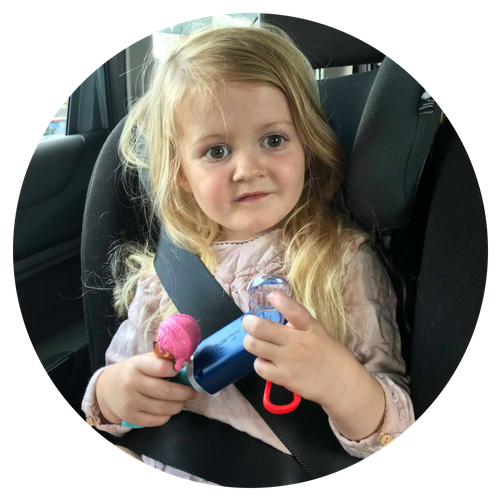 We’ve had the car seat now for a few weeks to give it a thorough road-test and it hasn’t disappointed. Maggie is super comfortable in it; and happily clambers into her seat to be belted up. She loves the seat being tilted on long journeys so she can sleep – she’s a big fan of motorway snoozing – and hasn’t complained about feeling uncomfortable at any point. We fully recommend and have been absolutely delighted with the seat. But the final verdict, I’ll leave to Maggie, who gave it a double thumbs up and an extra big grin – and I couldn’t agree more. The Apramo Eros retails at approx £199.00 through various retailers. You can check out further details about the Eros on Apramo’s website here and don’t forget to have a gander at their fab range of dining sets and other accessories too. 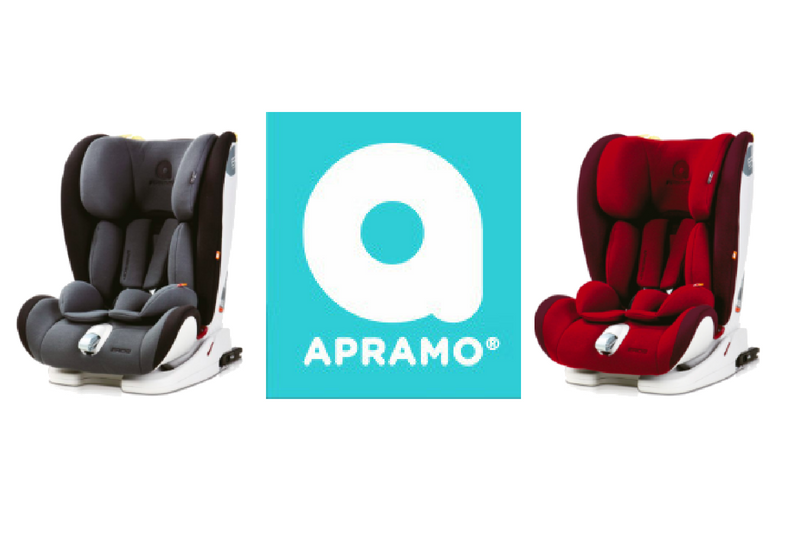 Disclaimer: The Apramo Eros car seat was given to our reviewer in exchange for a review on The Motherload® website and group. However, as with anything that we review on The Motherload®, this review is only conducted and written in line with our own honest findings and experience.